In Ann Lindsay’s workshop, we had two winners. Richard won the plein air easel and Lorraine won the gift certificate. Amazing! Pictures are coming. This is the last dinner for them. No more workshops until Melody Johnson. It’s a whole new world. First Winter Workshops and now Fiber Art Workshops. The wonderful people of the fantastically wonderful Sharon Carson workshop, we salute you! Here is your Photo Opportunity! Hurry back soon you were all a delight to have here. Just take a look at what fun these people are having! We had a winner. In Sharon Carson’s class, Bonnie won the free tuition for the Winter Art Workshops!!!! Next year, the Winter Program will be rolled into the Summer Program. Ann Lindsay has the rest of the winners. The plein air easel and the $100 gift certificate. Lois Woolley, co-author of The Yin/Yang of Painting, is a well-known portrait artist. A popular instructor at the Woodstock School of Art, she is loved for her warmth and personal attention as well as for her clear, articulate instruction. Lois brings yin and yang to the traditional study of portraiture. In this class you learn to create rich, natural skin tones using a unique palette of complementary colors. An emphasis on traditional elements of portraiture; lighting, form and how to paint the feature, plus how to use setting and composition to convey character make this an innovative workshop. Well, you might know that we had some problems with the brochure. A number of people didn’t get it and wanted it. So, we sent out an email asking if anyone wanted but didn’t get the brochure. The response has been off the charts. So, if you did not get the mail and would like to be on our mailing list, please contact us. They’re out there practicing still life’s in order to better their landscape painting. Everyone is enjoying the exercises and are improving dramatically. This workshop has been an oil and acrylic painting workshop. This has been another lovely crowd. Everyone is fun and they are enjoying the workshop and the cooking. Very good group, fun, funny and motivated. Kim and I took some pictures. I hope to have those up pretty soon. Well, I did the pozole rather than the steak. They loved it. I used ancho and chipolte with only a hint of New Mexican Green chilies and some smoked hot Spanish paprika. I served the chicken again but I made up a green bean dish rather than the olives. I loved it. Green beans with roasted peppers and diced black olives and the pea sauce covering that. The pea sauce came out great. I added tarragon. Lovely. Is it flurries or a squall? Big debate here whether the weather is a squall or flurries!!! I say flurries but John says squall. And it says that flurries are “A brief, light snowfall. Sounds the same just about. I always think of squall as an out to sea storm. OK. So, what new ice cream will I be serving? Yes indeedy. That Cuisinart, $40 machine, has served me well. I made a banana, strawberry and saffron ice cream with vanilla. I also made a very strong vanilla, using Tahitian, Mexican AND Madagascar vanilla and then at the end I added black berries and some dark chocolate chips. 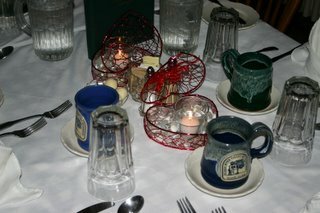 For Valentine’s day, Kim and I went out to the Arlington House, a nice restaurant. One of the desserts that they served was chocolate pate. Basically, it was 55%-60% shaved dark chocolate. I think I’ll get an 85% dark chocolate block and do the same for the April workshops. I think I’ll serve that with a chocolate mouse and a chocolate chip cookie. Yes, I just stole the Arlington House dessert except MY chocolate chip cookies are better. InnSanely tired of the snow? Come up here. We barely have any snow. Just a sprinkle! Can you beat that? Where has all my beloved snow gone? 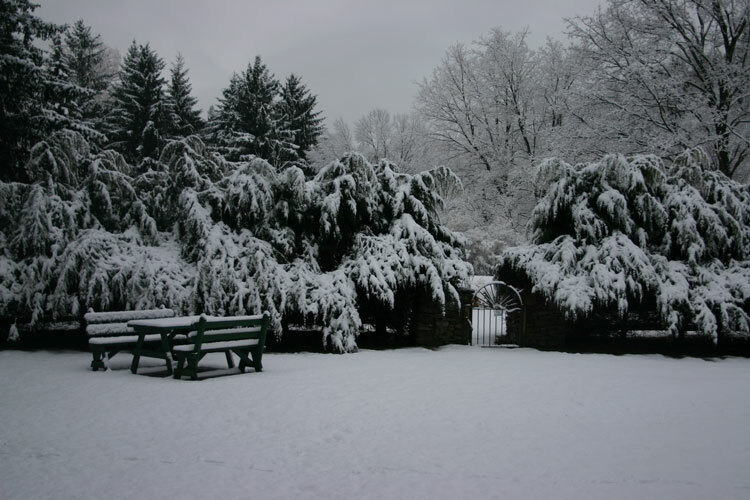 Mother Nature keeps teasing us with a light dusting now and then but just as a winter landscape painting workshop is about to begin it rains or heats up to 50 degrees. But so you see that there really is some wonderful snow here in upstate NY (like you ever doubted! ), here are a couple shots we took right before the Stanley Maltzman workshop in January. 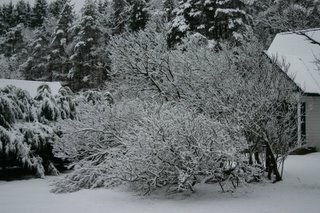 I love it when it first snows enough to load all the branches and twigs of the trees and shrubs with a layer of snow. It is a magical scene. You have to catch it before the snow starts to overload the branches and falls off. Well, since I can’t play in the snow (meaning take loads of pictures and marvel at the beauty of winter), I have been creating new table decorations for the dining rooms at the inn. Here is a picture of the decorations for the month of February. Finally got the snow we’ve been promised. However, it’s very light, almost not there. I doubt it’s an inch. It looks beautiful, however. Very beautiful. And now for Betsy’s watercolor painting class. This was also a great class and fun was had by all. During this class, Kim found the ice cream maker that Tish had left. Lynn, sorry you missed this one. You would have loved that ice cream. Sorry Mary, the better picture didn’t upload properly but this one is good. S and R, the Canadians, ey? P and L, the Italians, eeeeeeeeeeeeeeeey. Well, you may have noticed that I’m using initials now rather than names. No reason except for fun. I guess I’ve gone a little Hollywood! I forgot to get pictures of people eating for this class. Dang! So remember, when you come, remind me or Kim. Well, finally we got some of the photos of Stanley’s Winter Pastel Painting (art) Workshop transferred. However, some of the good ones didn’t make it. Ever since Kim started using a Mac to do the transfer, rather than her HP, many files have not made it over. Well, to go with the Austrian cuisine, I served the scrod last night, I served soft pretzels. Yes you heard me! Fresh pretzels with red Hawaiian seasalt. Red for February, natch. Now don’t you wish you’d come during the Winter? You do the math. I make two quarts for the price of 2 gallons of store bought. 1/2 & 1/2 and heavy cream only with fresh vanilla, Madagascar in this case but later I’m going to do a blend of Mexican, Madagascar and Tahitian vanilla with fresh mint leaves and dark (50-60%) chocolate chip! Yummer!